I imported the FBX posable figure I generated from Autodesk Character Generator into Poser Pro11. I posed her and added a hi-res square plane. I subjected the plane to a windforce and ran a dynamic cloth simulation. I also used camera focus effects and rendered in SuperFly using only HDRI and IDL for illumination. There are no lights in this scene. Cool idea. I should try out windforce on my cloth sims. @willdial I tried that recently while beta testing a dynamic piece of clothing for one of the CAs at HiveWire. To tell the truth, before that I hadn't even known we had a Windforce option. Until the CA pointed it out to me, and asked me to try it out to see if I could get the same results he was getting, I would never have thought of it. That said, I didn't particularly like the results, but I guess it depends on the item you use it on, and the settings you use. The only problem with the wind force that I've seen is that it takes a lot of trial and error to get the results you want. I don't like that you can't operate the X,Y and Z axis independently. If you turn the generator 90 degrees on the Z axis, Y and X both turn it the same way. That needs to be fixed. The example above was my 11th or 12 attempt to get this cape right. It's still not flowing the way I wanted it to, but it didn't look too awful, so I gave up and went with this. @rokketman have you inspected the rotation order of the wind-force prop? I any actor's middle order axis is rotated 90 degrees, it enters gimbal lock, having aligned the other two axes, so that neither is at all orthogonal to the other, thus locked. The way to prevent that is to parent the prop to a grouping object, and perform the first axis rotation on the grouping object, which remains unaffected by rotations of the child prop. @anomalaus Wow, thanks for that. I'll try that the next time I do a wind force sim. Hmm, I think I just found the theme for my next render contest. Using Poser to depict the weather. But no nice sunny days. Hmm, maybe have a first and second place winner??? Gotta think about this one some more. One thing I have found is that you need to be aware of where the wind ends. I was using 4 windforces to emulate a person in water. I found that the one in front would work as expected pressing the clothes against the body, but as the end of the effect was beyond the back of the person it affected the clothing there even where the body should have "shadowed it". It might just have been a one off glitch but just thought I'd share in case anyone tries this sort of thing. I remember that when Poser 5 came out PhilC recreated the famous Marylin scene over the subway vent, it was very effective, I must have a look and find the original files that he made available and try it out again. Alas, upon checking his site, it appears to have gone the way of a lot of great Poser stuff over the years. 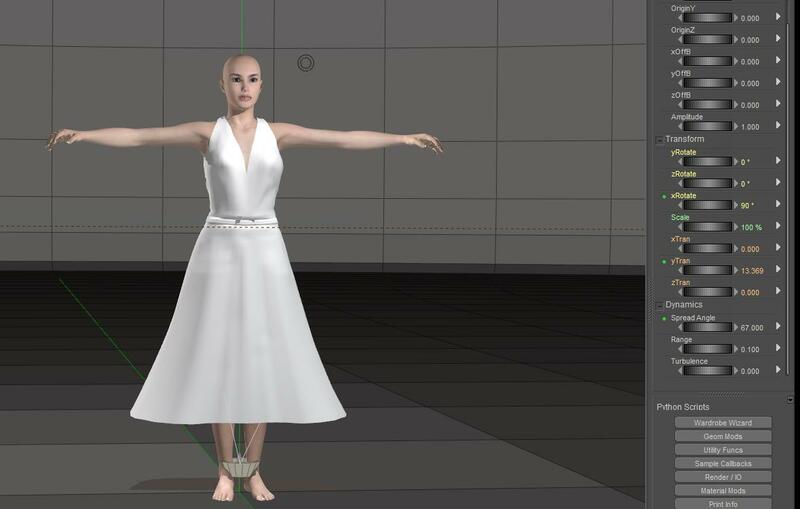 Well I found the dress hiding away in my Poser 5 runtime, by no instructions - looking for suggestions on settings. @tastiger first thing to work out is whether the Range units match your preference units. She should be in the iconic pose at frame 10 or 15, if you are using 30 frames to animate the simulation. That way, you can use any frame after that as your render. One thing I've noticed with the wind force is that after about frame 20 on a 30 frame simulation, the wind force seems to stop affecting the simulation and the cloth starts to settle again unless the amplitude is set high, and then you run the risk of over doing it. You will have to play with the settings and get ready to run the sim several times until you get it right. And the fingers of your figure will poke through the dress. You will probably want to use the morph brush to fix that. Thanks for the chart, just what I was after. @tastiger Thanks, and remember that the params are affected by how dense the mesh is. You can use the wind force on more than just cloth sims. I used it on Jessi's hair here. @rokketman I wouldn't be surprised if that's what the Wind Force option was originally created for, and the use with clothing became an additional option when it turned out working well.